The fight against the Eclipsed Celestial Spirits continues! One by one Natsu and his friends seal the spirits away, but just when they think they’re ahead of the game, their true enemy is revealed and the real fight begins. Will the gang be able to save the spirits before it’s too late? Of course, it’s never all work and no play for Fairy Tail. After the fighting subsides, our heroes make plenty of time for adventures in babysitting, transformation magic mayhem, and visiting other guilds as part of an exchange student program. 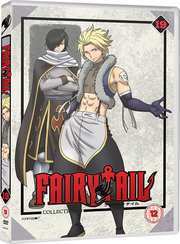 Between adorable creatures falling from the sky, a shocking job only Laxus can handle, and a scent-obsessed zombie outbreak, there’s never a dull moment for the wizards of Fairy Tail!